Betsy Bibby was the first of 9 children born to Richard Bibby (1825-1860) and Martha Barnes (1827-1886). She was born on 19th September 1846 at Bold Venture, Over Darwen. She was christened Betty but was later known as Betsy. The birth certificate tells us that her father, Richard, was a spinner and that he could not read nor write as he signed his name with an 'x'. Her mother was formerly called Barns (spelt without an 'e' on the certificate). At the age of four, in 1851, Betsy lived with her parents at Catty Gatte, which was up near Bold Venture Park. Her father Richard, still a spinner, was 28 and was born in Salmsebury; her mother, Martha, was 24 and was born in Eccleshill. She has two siblings, Margaret Ann aged 3 years and John aged 5 months. Betsy's father, Richard, died in 29th October 1860 of phthisis (consumption or tuberculosis). In 1861 the family are living at 62 High Street, Darwen. Martha, a cotton weaver, is 33, Betsy is 14 and a cotton piecer, Margaret (down as Mary W in the census), is also a cotton piecer, and she is 12; John, aged 10, is a cotton coiler, Edward is 6, Mary J is 2 and Joseph is 4 months and was born after his father had died; all were born in Over Darwen. Betsy's mother, Alice Barnes, who is 57 and a widow is house keeper. Alice was born in Tockholes. Cotton piecers worked in the spinning room; they mended threads which broke during the spinning process. Because they began this work when they were young they were often called 'little piecers'. They were usually employed by the spinner, rather than directly by the mill owners. 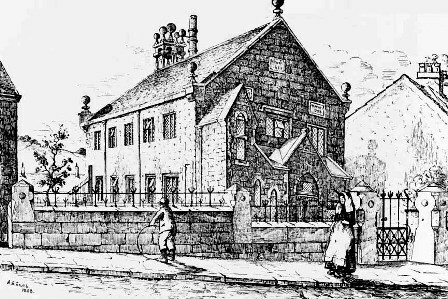 Betsy married James Ward at Lower Chapel, Over Darwen on 11th June 1870. They were both 23 years old; neither could read or write as they gave their 'mark' (this could explain a lot of the discrepancies in the different documentation). James was a cotton spinner and Betsy a cotton piecer. James lived at Sandhill whilst Betsy lived at Bonny Street. James' father, also called James (deceased) was a stone quarrier whilst Betsy's father, Richard (deceased) was a cotton spinner. The witnesses were John Ward, Mary Ward (probably James' siblings) and James Ainsworth. There is something odd about this: according to the registry office in Blackburn, marriages were not performed at Lower Chapel as they did not have a licence for this. Certainly, there are no marriages on the Lancashire Parish on-line records, yet I have the marriage certificate and it clearly states Lower Chapel? After their marriage the newly weds must have moved to 8 Bonny Street, as this is where they are in the 1871 census. I cannot find Bonny Street on the 1909 map, but the census goes from Star Street to Bonny Street to Redearth Street. James is 23 and a cotton spinner, Betsy is 24 and a cotton spinning piecer; they have two children, Richard who is 2 years old and Elizabeth Ann who is nine months old. So Betsy had Richard before she married James Ward; indeed, the Lancashire BDMs has him down with Bibby for the surname of his mother and father, indicating Martha wasn't married. However, the plot thickens because according to the Parish records, Richard Hy Ward was born on 24th August 1871 and Christened on 11th February 1872 to James Ward and Betsy (formerly Bibby) at Rock Terrace. There is no Richard Bibby in the Lancashire BDMs for this year. So it looks like they tried to pass Richard off as James' son and, perhaps, lied about his birth date. Indeed, the plot might thicken even more: as I was searching the Lancashire Parish records I found another Richard Bibby baptised at St Johns on 22nd December 1866. His mother is Betsy Bibby and she lives in Blackhorse Street (one assumes this would have been behind the Blackhorse pub)? There was a note in the margin that his father was dead. Could it be that Richard was baptised twice? I don't think so. I have searched the Lancashire BDMs to see if there was another Betty or Betsy Bibby born in Darwen around the same time and found a Betty Bibby who was born in 1841 but she married a Peter Haworth in 1859, so it looks like our Betsy Bibby had a son, Richard Bibby in 1866 and he died the same year. The Parish records say that Elizabeth Ann was born on 13th June 1870 and Christened on 21st August 1870; she,too, was born at Rock Terrace, also to James Ward and Betsy (formerly Bibby). As Betsy and James were married on 11th June 1870 and Elizabeth Ann was born on 13th June this suggests they only just got married before she was born, unless the records are wrong. Elizabeth Ann dies the following year. By 1881 the family had moved to 25 Barton Street; James and Betsy are both down as being 30 years old; Richard is down as Richard Hy Bibby and is 12 years old; like his step-father, he is a cotton spinner. Elizabeth, who was born in 1874, is at her grandma's, Martha Bibby, 1 Bonny Street, and is down as being 6 years old whilst James and Betsy have three more children: John W., aged 9; James 4; and Margaret A., who is 2 years old. I was confused for some time as I was only aware of Elizabeth Ann, then as I was going through the Lancashire BDMs I found another Elizabeth Ward (mother Bibby) born in 1874. I looked at the deaths and found that Elizabeth Ann had died in 1871, so this explained the discrepancy in the age of Elizabeth who was staying with her grandma in 1881. In 1891 they are living at 8 India Street. James is 45 years old, Betsy, 46, Richard Hy Bibby is 22, and John William, 19; both sons and father are cotton spinners. Elizabeth is 17 and a cotton weaver. Margaret Ann is 11 and there is now also Joseph 9 and James 7. According to Lancashire BDMs there was another James Ward (nee Bibby) born in 1884; it is unlikely there would have been two sons christened James so I searched deaths and there was a James Ward from Darwen aged 7 years who died in 1884, which is the same year that the second James was born so it is likely that he was Christened after the James who had died. Of course, to confirm this for definite I would need to acquire the relevant certificates. I'm not sure where James senior is in 1901 as he is not on the census with Betsy and the family; is it possible he is away fighting in the Boar War, even though he must be about 55 years old? Certainly, Joseph (1882) and James (1884) are likely to be away at war. In fact I cannot find Betsy in Darwen with any of the family. I did, however, find a Betsy Ward who is 46 years old and married; she is visiting George Holt, widower, in Burnley. Could this be our Betsy? In 1911 Betsy is 64 years old and is living with my grand-parents, Joseph and Bridget at 11 Malta Street. Meanwhile James, aged 64 years, is at his daughter's house, Elizabeth Ann with her husband, Richard Holden, and their children, Betsy aged 8 and Ellen aged 1. It looks to me like they have split up. There is a Betty Ward who dies at the age of 74 in Darwen in 1921. I need to acquire the death certificate to confirm this is our Betty/Betsy. Richard Henry Bibby (c.1869-1902) married Betsy Haworth in 1898 and they are living at 26 Sydney Street, Darwen in 1901; Richard is a cotton spinner and Betsy a cotton warper. Richard dies in 1902, perhaps in the Boar War? The 1911 census has Betsy Bibby who is aged 42 years, as a widow and living with her aunt, Sarah Chadwick aged 54, her sister, Nancy Chadwick aged 52, both are single, and another sister who is also a widow, Hannah Knowles aged 60. I then searched births and found that Betsy Haworth was Christened at Holy Trinity on 12th July 1868, her father is Christopher Haworth and her mother Maria. Searching Lancashire Parish records I found Christopher's marriage to Maria Chadwick. Christopher signed his name with an 'x' - he was of full age, a weaver and a widower and lived in Grimshaw Street, his father was John Haworth, who was a weaver. He married Maria Chadwick, also of full age who was a winder and a spinster and lived in Bolton Road. Her father was Joseph Chadwick, he was a spinner. The witnesses were Eccles Eccles and Alice Haworth. John William Ward (1872-?) marries Margaret Ann Lingard in 1899 and they live at 1 Malta Street in 1901; John is a cotton spinner and they have a son, James who is just 10 days old. By 1911 they had moved to 32 Ratcliffe Street; their son John is ten years old, they have another son, Thomas, who is 8 and Margaret's sister, Emily Lingard is staying there. She is a weaver and is 36 years old. What I find fascinating is that several years later May Ward and her husband Jim Turnbull and their family lived at the same address. I spent many happy hours in my childhood at 32 Ratcliffe Street. Elizabeth Ward (1874-?) married Richard Holden in 1898 and in 1901 they were living at 7 Ashton Street, Darwen, both were cotton weavers. By 1911 they had moved to 20 Hillside Avenue and had two children, Betsy who is 8 and Ellen who is 1. Margaret Ann Ward (1880-1898), I couldn't find any marriage details for Margaret Ann, nor could I find her in the census for 1901 or the one for 1911. Unfortunately, I did find a Margaret Ann Ward who died at 18 years of age in Darwen in 1898 which suggests it is our Margaret Ann as she would have been the same age in 1898. Joseph Ward (1881-1951), my grandad, must be away at the Boar War in 1901, which he clearly survived as he married my grandma, Bridget Shannon in 1906. James Ward (1884-?) It is likely James was in the Boar War in 1901. I need to do more research to find out what happened to James.